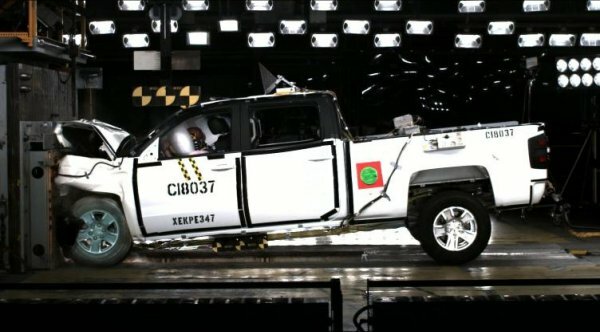 The new Chevrolet and GMC crew cab trucks, popular as work vehicles, became the first pickups to achieve full five-star scores under the new crash test rating system from the NHTSA. General Motors' new 2014 half-ton pickup truck models have gone to the National Highway Traffic Safety Administration for crash testing and managed to come out of it not only with a passing grade, but with a first-ever 5-star score under the NHTSA's new crash test program. The 2014 Chevrolet Silverado 1500 and High Country and the 2014 GMC Sierra and Sierra Denali 1500 are the first trucks to achieve this 5-star Overall Vehicle Score since the NHTSA's crash testing changed in 2011. The tests apply to the crew cab models only, which amount to about 60 percent of the overall sales for each of the four models combined, but GM is confident it's smaller cabs will achieve similar scores. The newly-redesigned trucks now use fully-boxed frames, far more high-strength steel and more cutting-edge safety equipment than their predecessors did. Some safety options for the trucks include Forward Collision Alert, Lane Departure Warning, and Safety Alert Seat. The last alerts drivers through directional vibrations in conjunction with the other active safety systems, as debuted by GM in its luxury model cars a couple of years ago. The NHTSA's New Car Assessment Program changed in 2011 to include side pole testing, more size-averaged crash-test dummies, and the new Overall Vehicle Score rating to give consumers a faster reference. The NHTSA now also includes new crash avoidance technologies in non-score assessments and tests performance metrics for those systems as well.